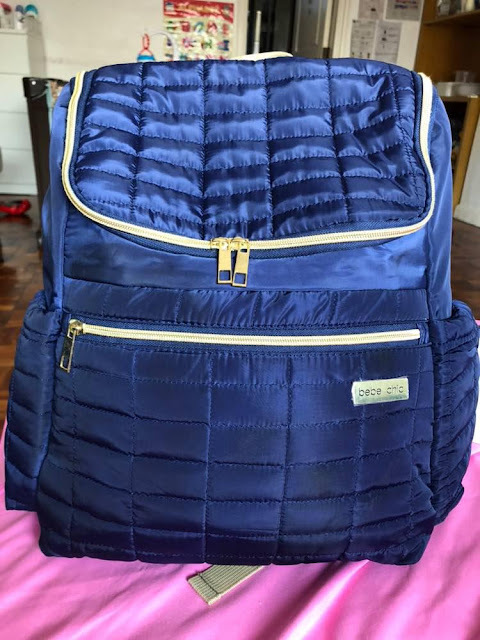 the canDIshhh tales: Bebe Chic Perry - a back pack, diaper bag! To be honest, I never thought of a back pack as a diaper bag. I'm used to seeing those sling type or shoulder bag types. We used to have those Skip Hop ones but they've long been stored and I can't remember where we kept them. It then occurred to me that a back pack is actually a brilliant idea, I mean it keeps both your hands free, you don't need to keep switching shoulders because a backpack balances the weight equally on both shoulders. Why wasn't this explored years ago? Two years ago, I met a co-parent Catherine - little did I know that she is a mompreneur and that she and her husband founded Bebe Chic bags. It was only last year, when I bumped into her at ExpoMom North that I knew all of this! She was manning her booth! They distribute bobbleart bags, Cricut machines and Bebe Chic! 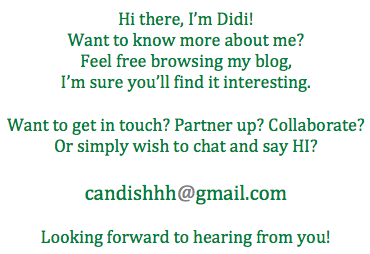 Since bumping into her, we became friends and are in constant communication with each other. And so after giving birth, she sent me a present, their newest design!! Meet Perry, one of Bebe Chic's newest models. This is a quilted back pack diaper bag. Look at it, does it seem like a diaper bag to you? Well, to me it's not - it looks so chic and so elegant right? You know what I noticed, first when I received it? The zippers! Look at the golden color - you'll be amazed on how smooth the zippers are when you open and close the bags and enclosures! I am one to always test zippers in a bag, an important thing is that the motion of opening and closing should be smooth without any stops or hitches - and I must say, the Perry's zippers passed my test. This is the Perry's back side. It's a backpack alright, but they've included some straps (left and right side) velcro that you can use to hang the bag on your strollers! Brilliant right? In my mind, since it's already a aback pack - there is no need to hang it on the stroller, but then here it is! You can hang it on your stroller! 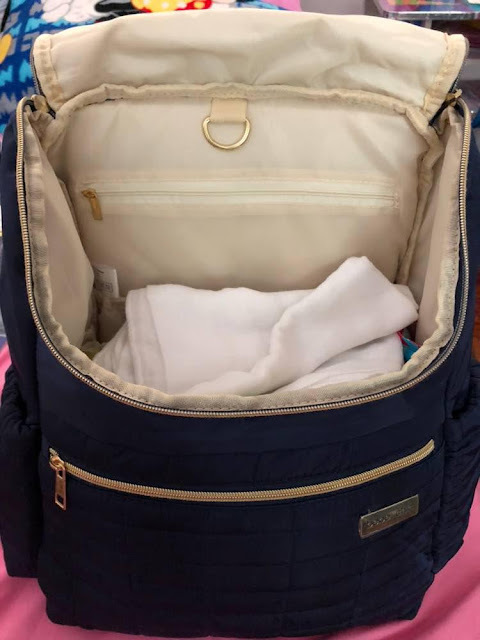 There's a zipper on the side that you can use as an additional compartment, inside it is a padded changing mat that matches the design of the bag! Matchy matchy, I like! The shoulder straps are soft and easily adjustable, just pull on the plastic attachment to loosen or pull the exposed strap to tighten - it's very easy! So easy that you don't even need to take the backpack off your shoulders to adjust! Look how roomy it is from the inside! I like that it opens up wide. No need to dig into the bag to look for its contents. As you can see, you can put a LOT of stuff there. There's also a zipped compartment at the back to keep your valuables. There are also garterized pockets on both sides of the bag (inside). Outside the bag there are also two insulated garterized pockets to hold keep warm or cool beverages (or breast milk)! 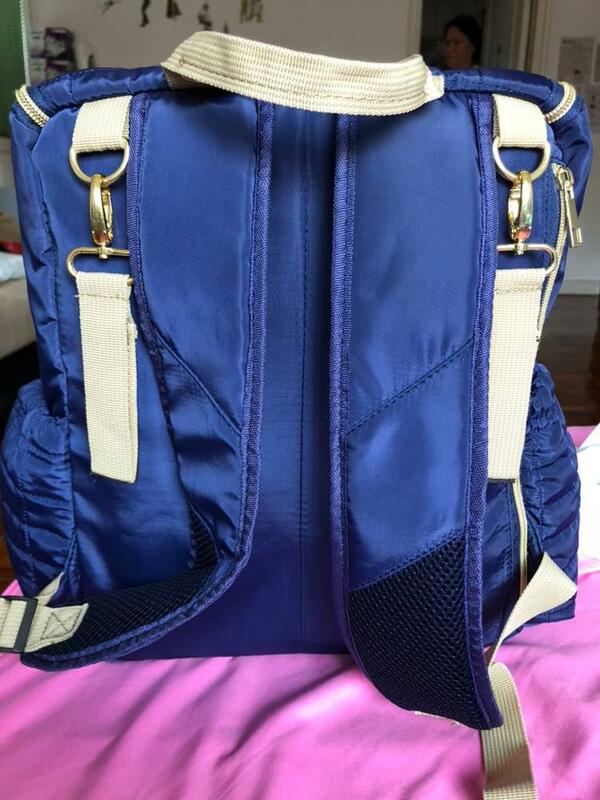 See that golden ring right in the middle on top of the zipper compartment? Well, that's a ring so you can hang it on to a - hook! Think public bathrooms, it's there so you can hang the bag while you get your things in order! Hahaha... Brilliant, right?! I am so loving this very well thought of back pack type diaper bag. It has a very stable bottom too, so it stands by itself when you lay it on a table, chair or on the ground. It's doesn't look too kiddie, nor is it cutesy, but instead exudes a sophisticated elegant feel. I'm so loving this diaper bag! It's so stylish yet so practical. Bebe Chic Perry comes in Navy and Black. Classy, right? Thank you Catherine and Mike! Thank you for the love and friendship! Thank you for thinking of us moms and parents.